Whether they’re searching the Internet, watching television, or browsing social media, Americans are bombarded with information related to their health, but the messages they’re receiving may not be understandable, reliable, or even credible. Faced with confusing medical terminology, conflicting reports, and a constantly changing healthcare system, people are looking to their local public libraries for guidance. That’s why the National Network of Libraries of Medicine (NNLM) is partnering with the Public Library Association (PLA): to help libraries meet the challenges of keeping up with evidence-based health resources and producing successful health programming. · Assess health information needs among public librarians in order to improve existing educational opportunities and develop new ones designed to meet the unique needs of public libraries. · Share free resources, information about successful library programs, and professional development opportunities by holding training programs and webinars, publishing articles and podcasts. · Unveil a new website (coming in early 2018) for public librarians that gives them easy access to training, tools and resources for consumer health information, health literacy programming and more. The Promoting Healthy Communities initiative will include two in-person learning opportunities. · “Public Libraries Supporting the Health and Wellness of Your Community,” Sunday, Feb. 11, at the 2018 ALA Midwinter Meeting in Denver. At this “unconference” event, attendees will be invited to connect with their fellow librarians to discuss the health-related topics that are most relevant to their needs. The session is open to all Midwinter Meeting registrants. Learn more and register for the Midwinter Meeting. · “Stand Up for Health: Health and Wellness Services for Your Community,” Tuesday, March 20, 2018, at the PLA 2018 Conference in Philadelphia. This one-day preconference will review core competencies of providing health and wellness services; coach participants through understanding their communities’ needs; and explore how to create fun and informative health-related programming for different age groups and special populations. Pre-registration is required, and up to fifty $500 stipends are available. Learn more about the stipend opportunity. Public librarians can find their regional office and access its resources at https://nnlm.gov/regions. · microlearning videos to inform library staff about NNLM resources. Finally, as Health Literacy Month (October) draws to a close, take advantage of the free Health Literacy Toolkit created by NNLM and the American Library Association (ALA). 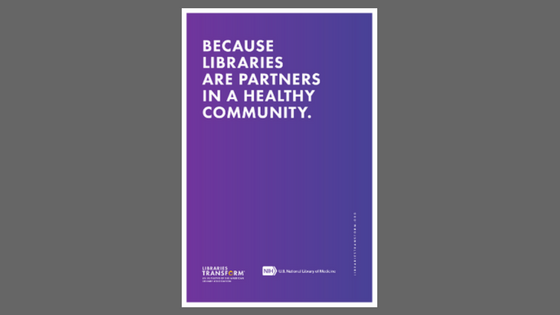 The toolkit includes customizable tools to raise awareness of how libraries support health literacy in their communities, including key messages, program ideas and downloadable marketing materials. We look forward to connecting with you in the months to come.